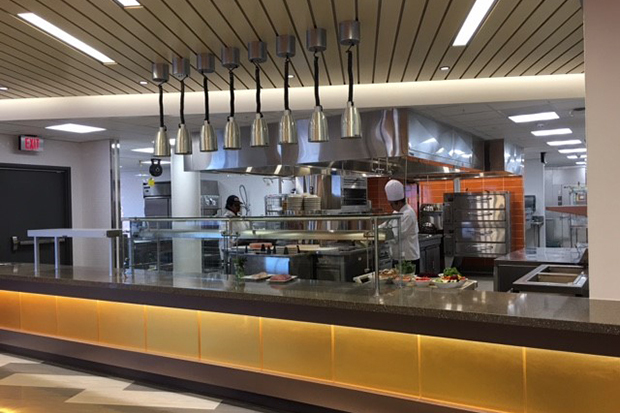 Falk College today announced the opening of the Susan R. Klenk Learning Café and Kitchens, a new hands-on learning laboratory to prepare students with traditional and emerging professional competencies for careers in food, nutrition, dietetics and public health. A dedication ceremony, reception and tours will take place Friday, Sept. 16, at 9:30 a.m. on the fifth floor of White Hall in the Falk Complex. The campus community is invited to attend. The new facility includes an experimental food lab kitchen, commercial kitchen, baking nook and café. A video camera system allows faculty and chef instructors to broadcast classes, food demonstrations and seminars from Falk College to anywhere on campus and across the country. 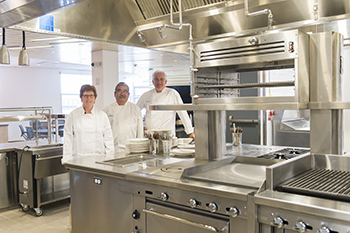 A generous and visionary gift from Falk College alumna Susan R. Klenk made the learning café and kitchens possible. A dual major in the School of Education, Klenk pursued a teaching career with the Syracuse City School District. Because her career always revolved around supporting students to help them be successful, she created the Susan R. Klenk Learning Assistantship in September 2009 that allows them to take a leadership role, provide support for classmates and gain valuable management experience. “Susan Klenk is a true advocate for student learning and a generous visionary whose ongoing support makes Syracuse University an extraordinary place to study food. With the opening of the Klenk Learning Café and Kitchens thanks to Susan’s commitment and support, Falk College, which began offering courses in food and nutrition in 1917, is leading the way in preparing students for expanding career opportunities in food,” says Diane Lyden Murphy, dean of Falk College. The learning café and teaching kitchens set the stage for industry-leading, forward-thinking approaches to food and culture, nutrition, research and food studies development. Its design fosters creativity and collaboration across a variety of departments, schools and colleges, creating interdisciplinary partnerships that support teaching innovation, student learning, research and scholarship. In addition to unlimited faculty-supervised hands-on experiences, this dedicated space will provide an ideal environment for student-faculty research projects and educational community partnerships that set the SU programs apart. For more information about the Sept. 16 event, please contact Falk College at 315.443.9816.